RE: Complete List of Supported GCodes? @Zax Thanks Zax, yesterday night I had a similar problem. Today I have found your answer just arrived before my question. Amazing. I have used most of the mentioned SW, but I have found some stopping or not working feature in all of them. T2laser allowed me to do everything I need to do. This means it is suitable for my needs. For cutting purposes it allows setting the number of passes (it depends on your laser power and the material you are dealing with). I am not a power user, but I think that T2laser is worth the cost. RE: Can EleksMaker EleksLaser-A3 Pro 2500mW cut through A3 350gsm paper ? @Jj-Lim Hi, I can confirm Zax: I didn't find a way to cut transparent materials, just a mark, not sharp, as the acrylic was a bit melted. @rurk Hi, just another idea: as the new laser is heavier than the 2.5W one, why not trying to decrease the speed? In order to maintain constant the power/time ratio, the power has to be decreased in accordance. I.e. if the speed is decreased from 1600 to 400 (1/4) the power too has to be decreased from 255 to 63 (1/4). Assuming that this is possible with the sw. you are using. Good luck! Another interesting point: swapping speed and n. of passes? I mean: doubling the speed and the n. of passes ensure the same cutting power? In my experience, this improves a bit the burning of the wood. But this works within certain limits, speeds between 100 and 400 are sometimes ok. Other experiences, opinions? @szerwi Unfortunately I never used Lightburn. I have imported the first image that you posted into T2Laser and run the Auto-Trace function. This is the result. Is it what you expect? I started using BenBox and EleksCAM, my experience was similar to your: none of them was able to satisfy me. I tested T2LASER for a while then I bought it as it was able to give me full control. IMHO T2LASER is worth the cost. Last but not least: I highly appreciate Zax's support. P.S. 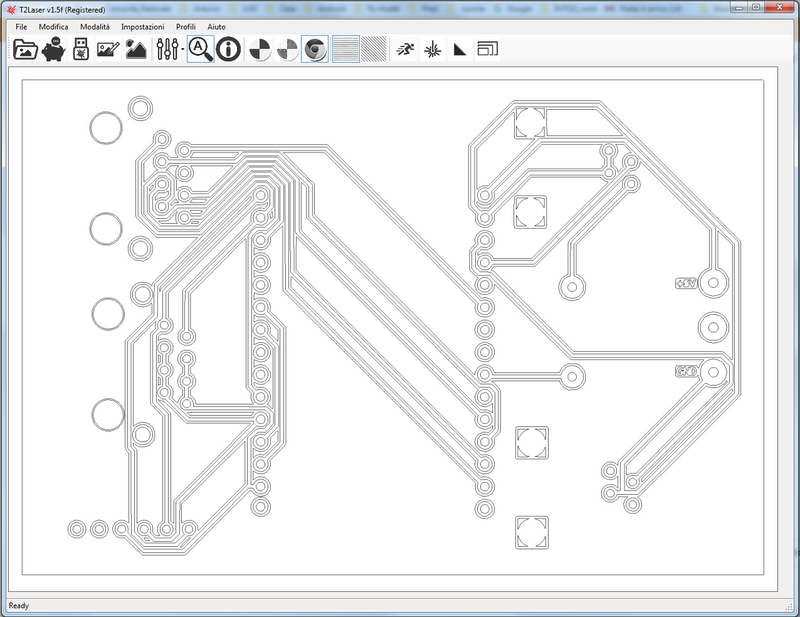 using Inkscape (free) you can save SVG files in DXF format (T2LASER imports DXF). I tested it for a while then I bought it as it was able to give me full control. RE: A good replacement PCB/driver for my Laser SW-LD45? Anyone? if the steppers move but the laser is not fired, probably the small board is gone. If this is the case, we have a problem... I was unable to find a replacement. But maybe someone more smart in Googling might find one. In this case I am interested to know the supplier. Last but not least: I have seen in the Banggood pictures for the A3 laser, 2 different types: a blue body laser or a black body laser. It seems to me that it is not only matter of colours.